As I said in my last post...I'm reinventing the blog...sort of anyway. I will leave the love story up for those that haven't had a chance to be blessed by it because it shows the awesomeness of GOD (which they may or may not know). I'll also continue writing the devotions that I call life lessons because it's in those moments that GOD teaches me how to change who I am into who HE needs me to be...and it's a good reminder for me when I may attitude shows I may have forgotten a lesson. However, I'm going to add a couple of other categories as well. The first being Homeschool Adventures. We are a homeschooling family. I do not claim to have a clue as to what I'm doing, but we chose this path to honor GOD (see Deuteronomy 6). So I'm inviting you along on our journey...if you don't have clue either, then maybe you'll garner something from it and if you're a seasoned homeschooler then maybe you can leave comment teaching me along the way (see Titus 2). This lead to another category...Reviews. From time to time I will be blessed to receive a product to use in our homeschool or otherwise and give you my honest opinion on it. Then there will be Giveaways...I can't keep everything I get..plus I know some pretty talented people that I think you need to know...so they and I want to share the love with you!! Finally, there's Mommy Mania...what is that you may ask...well here we go. Mental illness marked by periods of great excitement, euphoria, delusions, and overactivity. Let's be real...being a mommy can drive you to moments of mental illness!! You know those moments...the ones where you express great excitement (anger, shock, screaming)...they are moments of madness really...basically you have to laugh or cry...then you take a deep breath and pray in Jesus's name...otherwise your kids will be locked in a dungeon never to see the light of day again...you get the point. That deep breath and prayer I send up in Jesus's name always gives me a moment of clarity about what's really important...and it's not the lamp they just broke, or the family heirloom they just painted or in this case the table they decided to give Mater a bath on. It was winter afternoon and my daughter and I were working on one of her school lessons. 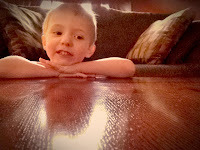 When we do this, my son (2 1/2 at this time) often joins us but his attention spans runs short and he usually heads off to build a fort or get a toy to occupy himself with. This day was no different, after he lost interest, he headed into his room and emerged with a toy he'd just received for Christmas...Mater from the movie Cars. I noticed my son had a washcloth and was wiping Mater, but didn't think much about it until we finished our lesson and I walked across the room. That's when Mommy Mania set in. I just began to cry...and I snapped, loudly I might add, "What are you doing?!?!" 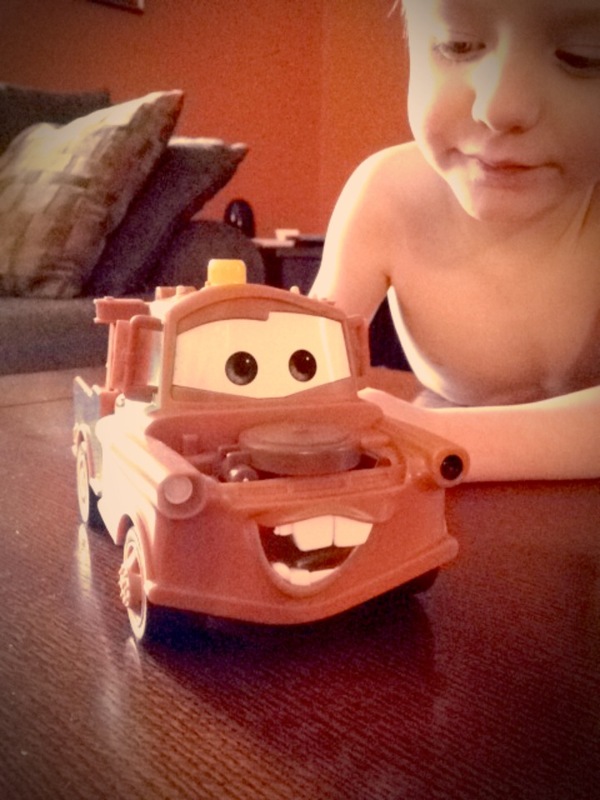 Looking at me with those innocent green eyes and the biggest grin you can imagine, he happily and proudly explained, "I'm giving Mater a bath." Why would giving Mater a bath be an issue???? NO AMOUNT OF WIPING WILL MAKE IT DISAPPEAR!!!!!! Quickly, I grabbed my phone and googled...surely there's a remedy. And there was...plenty of them actually. They ranged from baby oil, to Vasoline, to cigarette ashes, to wax paper with a hot iron over it, as well as a few others. Unfortunately, everything I found claiming to fix the problem did not work on my wood table. So I decided to try combining some of the remedies and see what happened...after all it's not like I could make it any worse really...look at it!!! Since it was winter time, I had some ashes in my fireplace...not the cigarette ashes it called for, but since I don't smoke it was the best I could do. I mixed it with some baby oil from a shower gift making it into a sort of paste. I then took a rag and dipped it into my mixture and began rubbing it in. I used a circular motion, like you would use waxing a car. Slowly but surely it began to work! Now, I had to rub long and hard, but my table began to like a wood table again! So crisis adverted and all is well in our home again...well at least until the Mommy Mania moment!! Oh my goodness, I completely understand Mommy Mania. I've been a maniac many a day in our house...lol.